Neat vacation home with own entrance and small terrace located on the ground floor of a beautiful mansion from 1798 that is inhabited by the friendly and discreet owner. 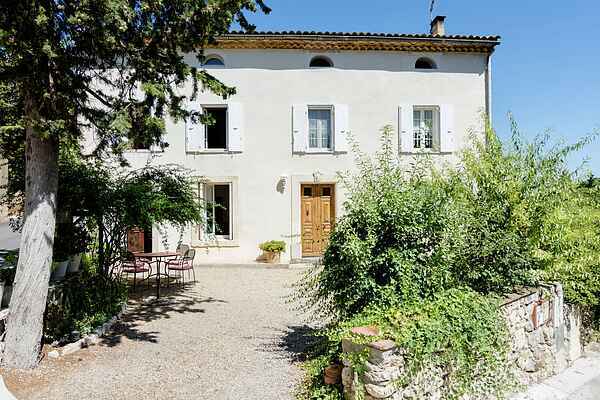 The home lies just in front of the fishing village Bages, in the middle of the impressive lake area where the Aude river flows. Here you'll find numerous picnic spots, fishing lakes and occasionally a beach to go for a swim. The area is wonderful for cycling (flat with small hills). Cycle from Bages to the lovely village Peyriac-de-Mer (6 km) and admire the flamingos that pass here for a stopover. A little further in Sigean (15 km) lies the safari park (Réserve Africaine) with more than 3,500 animals. After that you can refresh yourself near the harbor of Port-la-Nouvelle (25 km), where you'll also find wide sandy beaches. Tennis court, restaurant and small grocery shop in Bages (2 km). Restaurants, bakery and daily shopping in Narbonne (2 km). For a cultural experience you can visit the wine region Corbières with numerous fortresses, castles and abbeys. For example Fontfroide (10 km), and the city Narbonne (6 km) with its rich Roman history. This is also a good place to shop. Golf course in Narbonne (6 km).